I think my mother would tend to agree with your main observation - hard to find places are often the most interesting and unique places to be. Many...I think my mother would tend to agree with your main observation - hard to find places are often the most interesting and unique places to be. Many years ago my mother and her 5 children had to be evacuated from a war zone. May father being a doctor stayed behind and cared for the people caught in the cross fire of a greater event. We were evacuated to Rome, Italy - many stories to tell about this adventure, especially with 5 children and the unknown in front of us. My mother love history, loved discovering and exploring the new and the old. And so finding herself in Rome decided to turn what could be a challenging situation into a daily journey of discovery and exploration to some very easy to find places (like the Vatican, Sistine Chapel or Colosseum) and the discover of lesser know places of interest. Almost every day for 5-6 days a week (with one day off for Church and rest) we would have lunch while my mother would read to us of the places we were going to explore that day. Off we would go, hope on the bus, navigate the push and press of people without loosing anyone and arrive at some point of history and wonder which carried all the stories of place and time that my mother had researched and read to us. The month away from my father went rather quickly, but my imagination had been set alight for discovering hard to find bits of knowledge, fact or place. I am grateful to my mother for all the work and effort she put into the journeys of discovery. They say that the best way to get to know a place is if you decide to get lost there. I really love doing it if I have time - wherever I go i just...They say that the best way to get to know a place is if you decide to get lost there. Have you ever thought about the things that are there, but we don't see? No, I don't mean the neighbors' dinner, I mean the small hidden places that are right under our noses that we go by every day but never notice. I soon visited Budapest (more about the journey itself in a separate story), where a good friend of mine lives. So, besides the tourist sight views in the city, she took us to a part of the city with a lot of bars. I was astonished by the places' creativity and atmosphere - there were people crowding inside, chatting in what seemed to be all world languages, smiling, having a beer and relaxing. All that was created, I believe, by the places' design, plan and realization. They were all situated in this small inner backyards of something that in the near Soviet past may or may not have been some kinds of factories, which were turned to this magical place of beers and chill. 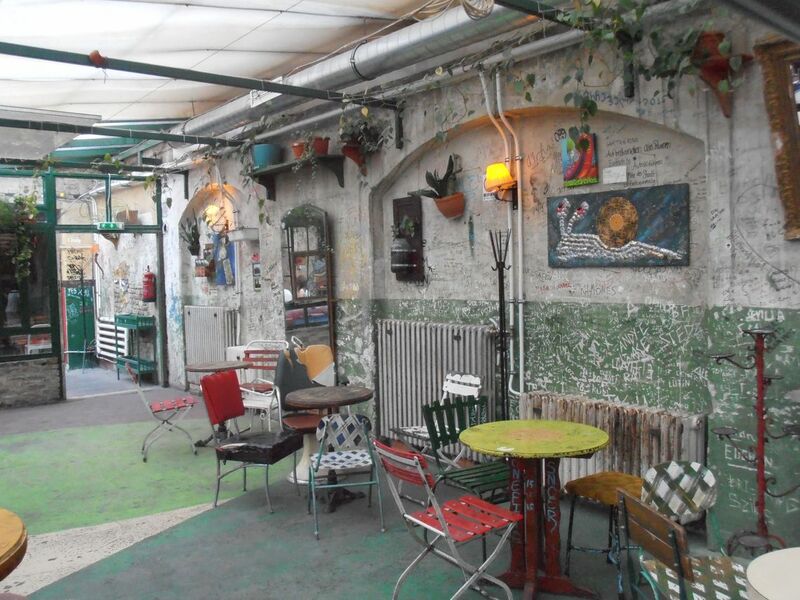 The decoration was all colorful, placed in the strangest way (a bicycle hanging above the tables; a huge stare at the wall, almost at the rooftop; plants inside all kinds of vessels hanging around; hats, old monitors). But what struck me the most was that all these colorful magical lands within a big city were in a way hidden. When walking down the street if you don't know they exist, you may not see the entrance and miss them entirely and never know they exist. Furthermore, if there isn't someone to take you, you may never even suspect that in an old ugly factory like this there may be something really beautiful and surprisingly spirited. In big cities there are, I believe, plenty of such hidden, interesting and not conventional places to go. I myself have some favorite in Sofia, where I currently live. The thing is that if someone hasn't taken me there or I haven't for example read about the place and went on purpose to see it, I would haven't seen it at all. My point is that the most valuable places to go, are hard to find, but when you find them it's worth the search. In fact, I think that this is true not only for the bars in cities, but also for example for small villages in the mountains and even for people - the best ones are hard to find and that is what makes them so valuable.